Our last six weeks have gone like this – rain, rain, rain, flood, tornadoes, flood, rain, HOT. 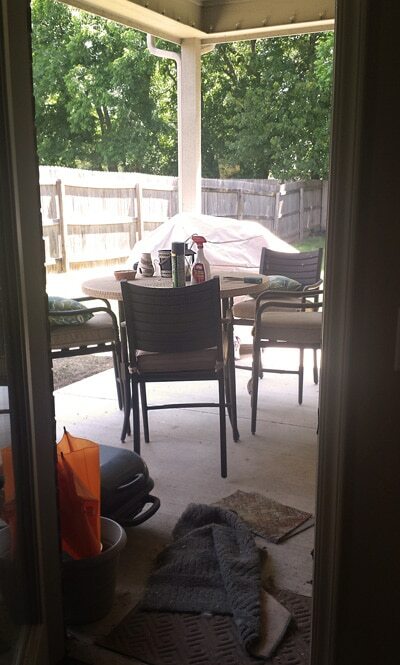 Sadly, none of those weather patterns were quite right for cleaning up the back patio for grilling season. 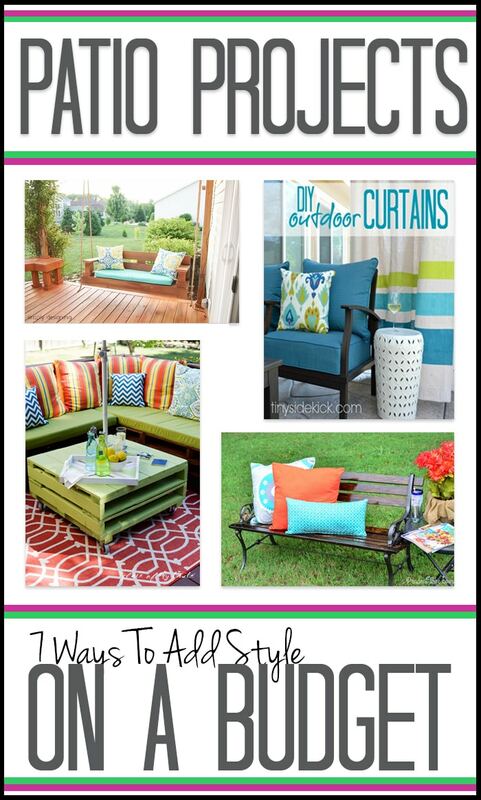 Now I’m left longing for a pretty back porch to enjoy the cooler mornings and evenings between the brutal afternoons. Since my weather forecast still isn’t conducive to fixing up my patio in reality, I thought I’d at least spend some time gathering ideas. And since I’m gathering budget friendly ideas for myself, it only made sense to share them with all of you! First, just for fun, here’s our forecast…I’d never survive in Seattle. I NEED sun! And for more fun, here’s the sad state of my back porch right now. Just a warning, you might want to squint and close one eye like you do in a scary movie. It’s bad. But don’t fear, the rest of the pictures ahead are less depressing and more inspiring. As always, make sure you click the image to go to the full post before pinning! Even though we have a pretty good size backyard and no house behind ours, the lot is narrow and the neighbors are pretty close. I’d love to have a little more privacy on the side and the DIY Outdoor Curtains by Corey at TinySidekick would be the perfect solution. And she figured out how to make them for $10/panel! I do love our bar height patio table, but it’s very neutral. I remembered that Katie from Addicted 2 DIY actually did a guest post here last summer that would be a great start to fixing the boring table problem. 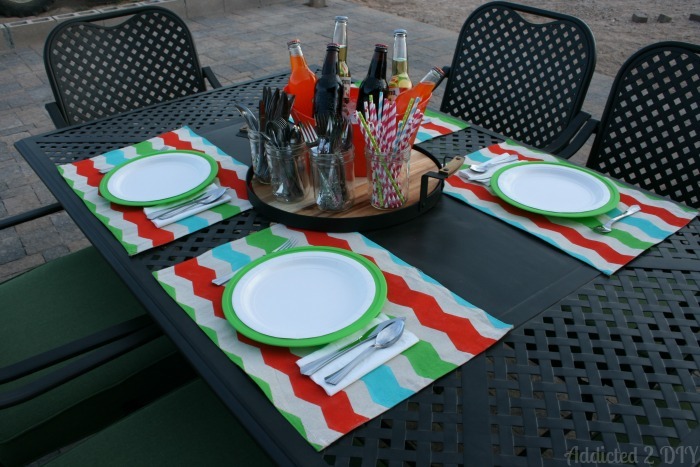 DIY Drop Cloth Placemats! They can be customized to any color or pattern and they are CHEAP to make. 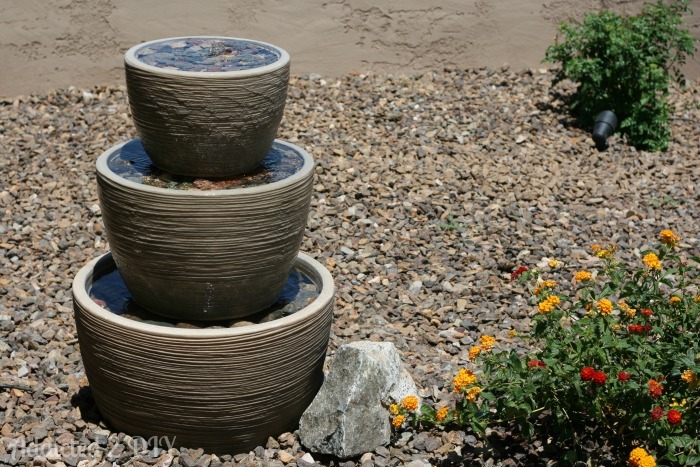 Speaking of Katie, she also created an amazing outdoor fountain from flower pots. I’d LOVE to have the calming sound of water in the background as I lounged outside. Building the fountain is easier than your would expect! And you know where I would love to sit to listen to the water? 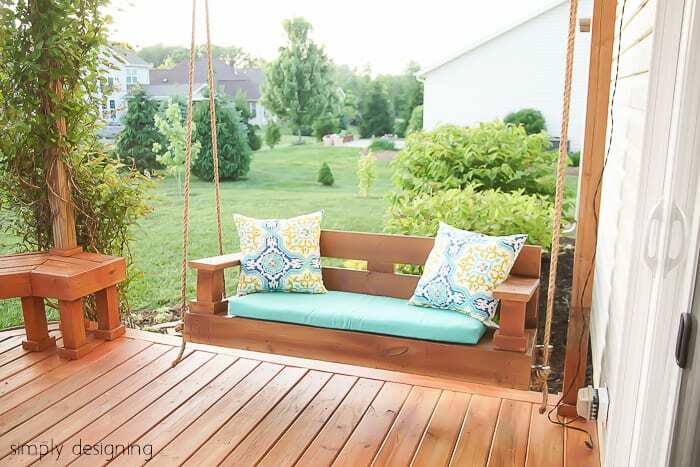 On this gorgeous DIY porch swing! 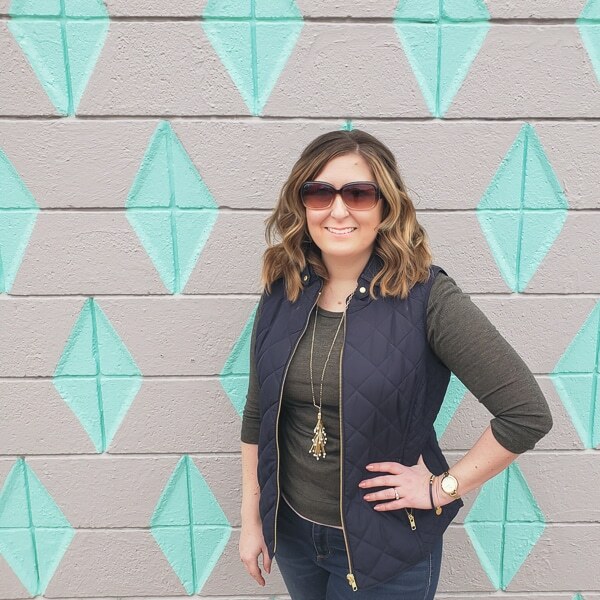 Ashley from Simply Designing knocked it out of the park with this one. The craftsman look makes the swing so welcoming! 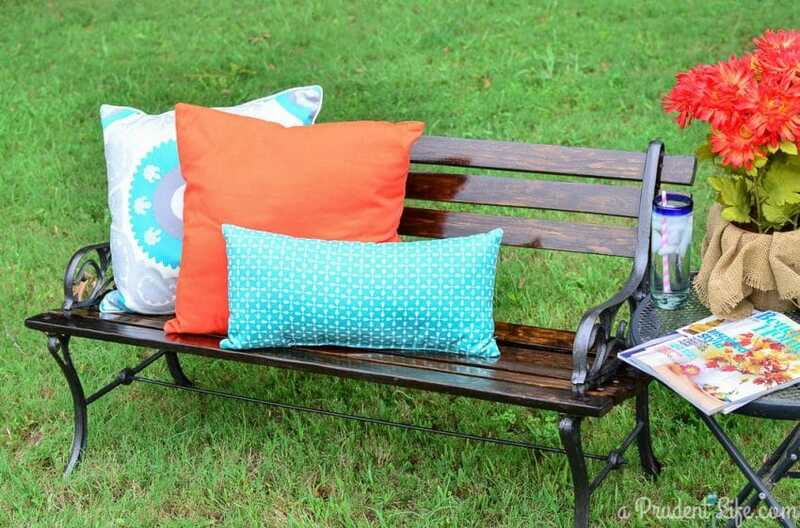 If you don’t have anywhere to hang a porch swing, a freestanding park bench is a great alternative. You can save some cash by finding a worn out bench at a garage sale and refinishing it like I did last fall for my mom. And since we are on a roll with the seating, plastic Adirondack chairs are the best! We have some around a cheap fire pit in the back yard and they are SO comfy. They are also the perfect firework-watching chairs. We carry ours to the driveway every year on the 4th of July. Eventually, the plastic fades though. Corey from TinySideKick figured out how to refinish them for just a few dollars! My big dream for the backyard includes extending the patio around the back of the house and having an outdoor living room. You know, next to the imaginary pool! I know extending the concrete will be pricey, so it would be great to save on the decor. Aniko from Place of My Taste has a great solution. 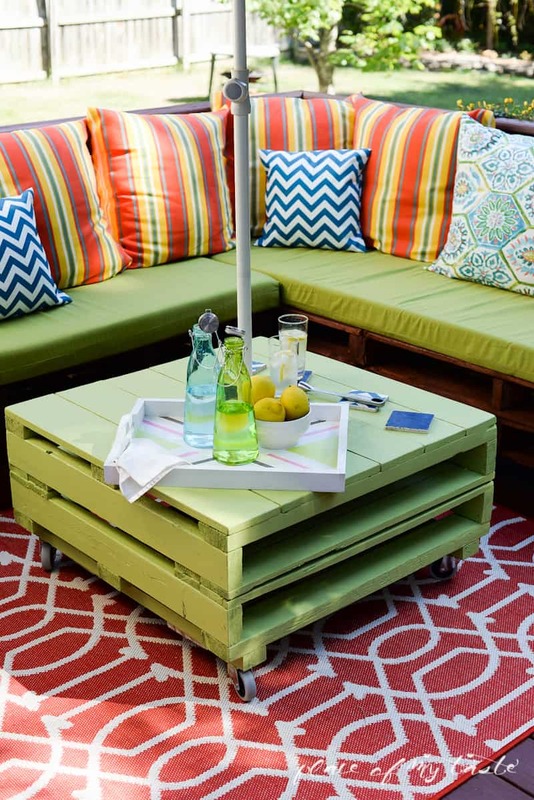 She made deck furniture from pallets. 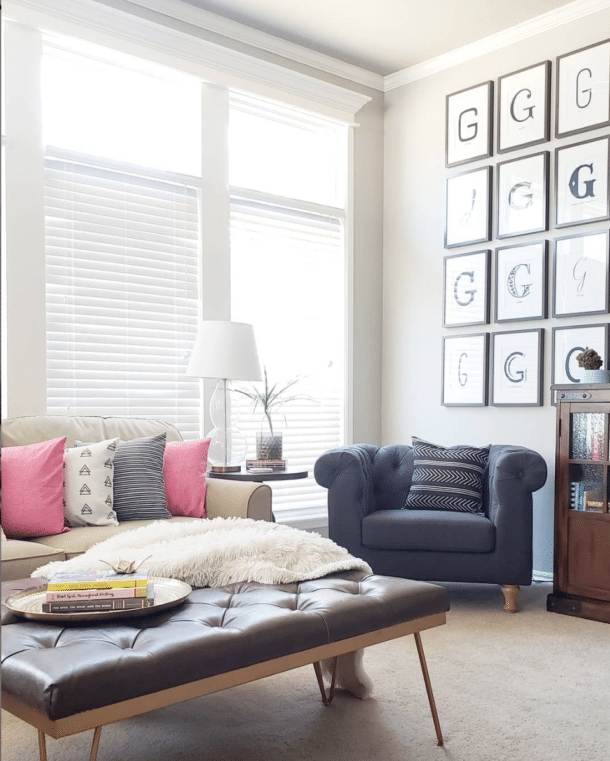 Like an entire sectional sofa and coffee table. Genius! 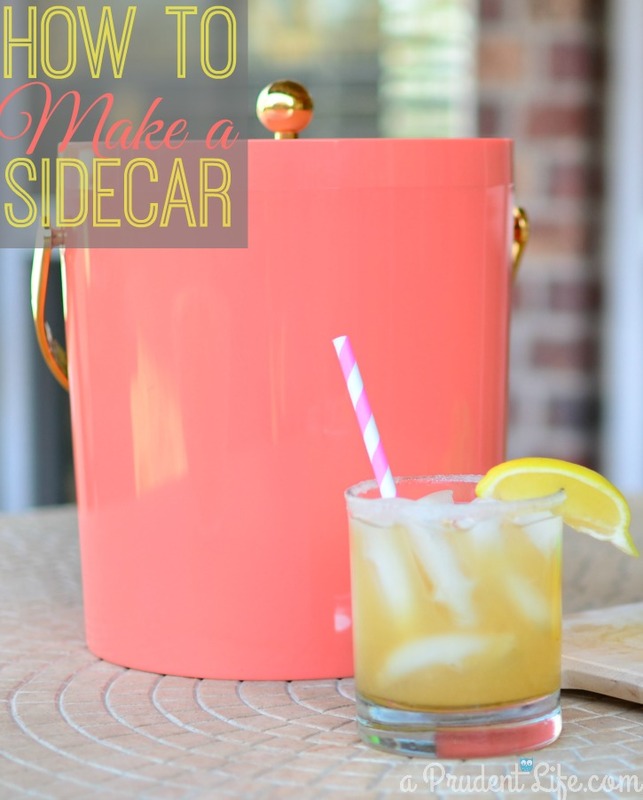 And once I finish the 7 projects above, I’m going to sit back and enjoy all the hard work with a Sidecar, my favorite summer drink! Let’s be real, I’ll probably have a sidecar long before I’ve finished any of these projects. Let me know which project is your favorite in the comments. There’s also an image for you to pin to your outdoor board below! « Freezer Organization: Free Printable to KEEP you Organized! Hmm. I know I used a Minwax stain, I can’t believe I didn’t put the color in the post! The big thing was using a spar vanish on top of it to protect the stain in the sun. I love the stacked pots fountain. I think I am going to adapt that idea, but make a stacked planter. I will plant succulents that hang down the sides and something really nice in the top pot. Thanks for the idea! That’s a great idea Brenda – I love it went inspiration morphs into even more great ideas!